Chieti (Italian: [ˈkjeːti] ( listen); Greek: Θεάτη; Laitin: Theate, Teate) is a ceety an comune in Central Italy, 200 kilometres (124 miles) northeast o Roum. It is the caipital o the province o Chieti in the Abruzzo region. Chieti lees on a crest alang the Pescara River a few kilometres awa frae the Adriatic Sea, an wi the Maiella an Gran Sasso muntains in the backgrund. Chieti is amangst the maist auncient o Italian ceeties. Accordin tae meethological legends, the ceety wis foondit in 1181 B.C. by the Homeric Greek hero Achilles an wis namit in honour o his mither, Thetis. It wis cried Theate (Greek: Θεάτη) (or Teate in Latin). As Theate Marrucinorum, Chieti wis the chief toun o the warlike Marrucini. Accordin tae Strabo, it wis foondit bi the Arcadies as Thegeate (Θηγεάτη). Efter the Marrucini wur defeatit bi the Romans, they became lyal allies o the mair pouerful forces. Their territory wis placit unner Roman municipal jurisdiction efter the Social War. In imperial times, Chieti's population reached 60,000 inhabitants but, efter the faw o the Wastren Roman Empire, it wis destroyed bi Visigoths an Heruli. Later it wis seat o a gastaldate unner the Lombard keengs. Efter its destruction bi Peppin, it became a fief o the Duchy o Benevento. Chieti recovered some poleetical an economic importance unner the Norman rule o Soothren Italy, a role it kept unner the Hohenstaufen, Angevine an Aragonese rulers an aw. Efter a cultural an airchitectural flourishin durin the 17t hunderyear, unner the aegis o the Counter-Reformation, Chieti wis decimatit bi fatalities frae plague in 1656. In the 18t hunderyear, several new academies an schuils wur developit here, which contributed tae the ceety's airtistic heritage. In 1806 Chieti wis turned intae a fortress bi Napoleon's Fraunce. In 1860 it became pairt o the newly creatit Kinrick o Italy. Durin Warld War II, Chieti wis declared a open ceety (like Roum) an wis no bombit bi either side. The ceety at this time walcomed mony refugees frae the near touns an veelages. Allied forces leeberatit the ceety on 9 Juin 1944, ane day Efter the Germans left the ceety. The bell touer o the Cathedral o Chieti. The Gothic Cathedral, re-built bi bishop Attone I in 1069. O that biggin anerly pairts o the Romanesque crypt remain. The kirk wis remade in the 14t hunderyear an the bell touer wis enlairgit. Efter several yirdquauks, the kirk wis rebuilt again in the late 17t-18t hunderyears in Baroque style. Kirk o San Francesco al Corso, foondit in 1239. The façade shows a incomplete Baroque restoration. Unner the kirk o SS. Pietro e Paolo an the adjynin hooses are extensive substructurs (in opus reticulatum an brickwork) o the 1st hunderyear CE, belangin tae a biggin erected by M. Vectius Marcellus an Helvidia Priscilla. Thare are remains o lairge reservoirs an o a auncient theatre an aw. In the early 21st hunderyear, new aircheological excavations are unner wey on the steid o the umwhile Campo Sportivo. Naitional Airchaeological Museum o the Abruzzi, "Villa Frigerj" - The rooms o the museum are dedicatit tae: Burial cults in pre-Roman Abruzzo / Italic sculptur / The Capestrano Warrior / The Pansa collection / The Sanctuar o Hercules Curinus at Sulmona / The Numismatic collection / Roman Iconografie in Abruzzo. Airt Museum - "Costantino Barbella"
Airt Museum, "Palazzo de Mayo"
The Varsity o Chieti (Università G. d'Annunzio - Chieti e Pescara) is based in Chieti an Pescara an hosts aboot 35,000 students, coverin auries o airchitectur, airts an philosofie, economics, foreign leids an leeteraturs, management, medicine, pharmacy, psychology, sciences, social sciences an sports medicine. 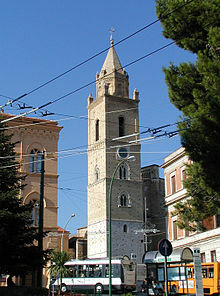 Chieti climate is considered genuine Mediterranean. It presents heich humidity aw year roond, wi rainy/snawy an quite cauld winters an hot an dry simmers. Rain is a common event, especially durin hairst an ware, wi accumulations o aroond 600 tae 700 millimetres (24 tae 28 in) a year. Snowfall is consistent durin winter, wi temperaturs that aften drop belaw 0 °C (32 °F) durin winter nichts. Fog is a common event durin hairst an winter, due tae vera heich humidity in these saisons. Wind frae the north-east (frae the Adriatic Sea) carries cauld frae Eurasian Steppe, while wind frae sooth-wast (frae the Tyrrhenian Sea) carries hot frae Algerian Desert. Wind is quite present durin year. ↑ Probably mentioned bi Pliny, H.N., II., 199. ↑ "Chieti Meteo". Retrieved 2010-08-11. This airticle incorporates text frae a publication nou in the public domain: Chisholm, Hugh, ed. (1911). "article name needed". Encyclopædia Britannica (11th ed.). Cambridge University Press. Wikimedia Commons haes media relatit tae Chieti. Offeecial steid o Airchaeological Museum "La Civitella"
Offeecial steid o Airt Museum "Costantino Barbella"
This page wis last eeditit on 5 Mairch 2018, at 05:32.